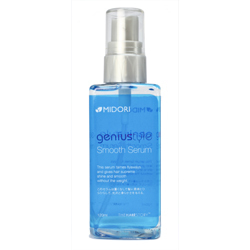 MIDORI GENIU-STYLES SMOOTH SERUM 120ML – HAIRDEPOT - Hair & Scalp Care Products, Prevent Hair Loss, Shampoo, Conditioner, Treatment, Styling, Appliances and more! The Serum tames flyaways and gives hair supreme shine and smooth without the weight. Applying to the finished style by smoothing on small quantities where required. Alternatively, use on damp hair before drying.